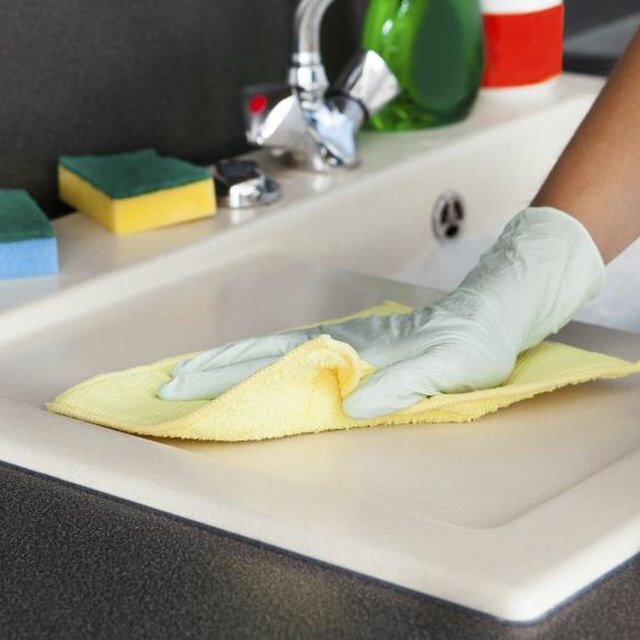 What Chemicals Are in Household Cleaners? Natural rubber is a polymer of hydrocarbon subunits called isoprenes; consequently, it's sometimes referred to as polyisoprene. Typically, natural rubber is treated to make it less sticky and more durable through a process called vulcanization. Natural rubber is waterproof and thus compatible with water in most applications. Organic solvents, however, are a little bit trickier. Various organic solvents can cause natural rubber to swell -- ultimately to the detriment of its stability and properties. Rubber can be made from either natural or synthetic sources. Aromatic compounds, such as benzene, feature a ring of carbon atoms that is more stable than expected, owing to the way electrons are shared around the ring. Benzene and toluene are two common aromatic solvents; both are incompatible with natural rubber and will cause it to swell. If allowed to remain in toluene for a sufficient length of time, crude natural rubber may dissolve. Natural rubber will also absorb m-xylene and benzonitrile, albeit to a lesser extent than benzene or toluene. Natural rubber can swell by absorbing other hydrocarbon solvents, including pentane, hexane, octane and methylcyclohexane. In general, the extent of swelling increases together with the number of carbons in a chain, up to six or eight carbons. Branching in the hydrocarbon chain decreases the extent of swelling. Iso-octane, for example, is compatible with natural rubber while hexane is not. Turpentine and gasoline are both incompatible with natural rubber. Polar molecules have an uneven charge distribution. Chemical groups, such as alcohols, carboxylic acids, ketones, aldehydes, amides and nitriles, make a molecule more polar. Increasing solvent polarity typically decreases the extent of swelling; alcohol groups are especially helpful in this regard. Indeed, many short-chain alcohols, including ethanol and isopropyl alcohol, are compatible with natural rubber although benzyl alcohol is an exception. Chloroacetic and benzoic acids are not compatible, however, and glacial acetic acid is somewhat less compatible than dilute solutions. Many chlorinated hydrocarbons are incompatible with natural rubber. Carbon tetrachloride, trichloroethane, ethylene chloride and chloroform, for example, are not compatible. Solvents, including diethyl and butyl ethers, are highly incompatible as well. Hot concentrated sulfuric acid will damage natural rubber, and phenol is not compatible with natural rubber either. Concentrated hydrofluoric acid and natural rubber are likewise an ill-advised combination. Does PVC Pipe Need Plumber's Tape? How Are Wax Toilet Bowl Rings Made?